Usually, judging a restaurant by its menu is about as reliable as judging a book by its cover. But at Bouillon Chartier in the heart of Paris’ ninth arrondissement, what you read is what you get. And what you get is what patrons at the historical bistro have gotten for the past one hundred fifteen years: delectable, unpretentious and affordable French cuisine. Max Dax and Thomas Schoenberger broke bread with owner Gerard Joulie, who, over a plate of steaming calf’s head and a bottle of Sauvignon blanc, explained the art of serving slow-cooked food fast. Gerard Joulie: Well, day in, day out, we serve strictly traditional French cuisine. This includes classic dishes like the steak frites or pot-au-feu — classic French beef stew. But still, the menu changes slightly here and there on a daily basis. It depends on the assortment of what we get wholesale. Sometimes you can’t find a certain vegetable in the necessary quality or quantity. Other times, a product might be too expensive. And last but not least, we’re constantly analyzing the daily statistics. Dishes that aren’t selling well are replaced by others, ones that fit better to the season or better complement the rest of the menu. It might sound like a paradox, but you have to improvise and continuously make minor changes every day to guarantee consistency over a long period of time. We’ve only really made one major change in the last decade—that is, we completely modernized the kitchen. But for the customer, it’s a change that remains invisible. Waiter: Bonjour messieurs. What would you like to order? a bottle of Pays du Val de Loire Cépage Sauvignon and a bottle of Touraine Marionnet. Have you two already decided what you’ll have for lunch yet? Thomas Schoenberger: I’ll have a dozen escargot and the entrecôte saignant avec frites [premium cut of beef with french fries], s’il vous plaît. Max Dax: I’ll have the escargot, too. And the tartare de boeuf [beef steak tartare]. Merci. Gerard Joulie: And for me the oeuf dur mayonnaise [hardboiled eggs with mayonnaise] and the tête de veau [calf’s head] please. We’ll decide on the cheese and the dessert later on. Max Dax: Interesting—he wrote the whole order on our paper tablecloth. He didn’t take any notes for himself . . .
Gerard Joulie: Writing the bill on the tablecloth is, like the recipes, an age-old French tradition. In Paris, the Bouillon Chartier is probably the only remaining restaurant that’s still allowed to do it. We had to fight hard for an exemption, though. The tax authorities are very strict when it comes to keeping up with handwritten bills and our accounting in general. And, of course, we only employ waiters with very good memories. Thomas Schoenberger: How do you keep your books? Gerard Joulie: We have a fail-proof system. It goes like this: Our waiter will place our order in the kitchen. When our appetizers are ready, he has to go to the cashier to enter his waiter’s number, the number of our table and the appetizers. He may have to wait in line for a few minutes with other waiters when it’s busy—carrying up to ten, twenty hot plates at a time mind you. After everything’s been registered, he’ll rush to the tables and deliver the food and then take new orders. But as guests, all we get to see is the handwritten order on the table. And the escargot, of course. Max Dax: The main reason why we wanted to meet you to talk about your restaurant might seem obvious, but I think it has larger implications. One of the things we’ll never be able to digitize is food. And yet, all over Europe people are less and less able to relate to basic traditions, traditional food or communal seating. Unfortunately, it’s a mindset that the majority of restaurants accommodate these days. Try asking a waiter about the ingredients of a given dish—I’ll bet they have to call a factory to find out. Gerard Joulie: I agree. And the funny thing is: We can be faster than McDonald’s! The tourists who come here love our system. They realize that they’ll get their food fast, but it’s not fast food. Thomas Schoenberger: What would you call it instead? 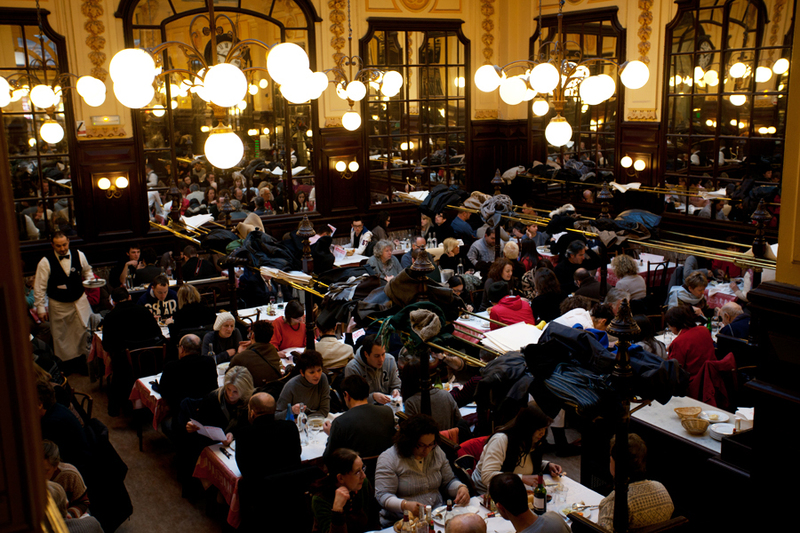 Gerard Joulie: I’d describe Bouillon Chartier simply as a relatively cheap cafeteria in the heart of Paris. Here, you could invite, say, ten people for dinner and you’ll pay maybe three hundred euros. This is something that you won’t find in the rest of Europe anymore, and certainly not in Paris. In fact, “bouillon” is the historical French term for a simple working-man’s tavern. Back in the day, regular customers could rent a little drawer here where they’d store their personal napkins . . . as long as they were able to memorize the drawer number, that is. Some of the walls are still covered with these huge old chests full of drawers, as you can see. In fact, the restaurant is actually a national monument. Max Dax: How many meals are served at Bouillon Chartier daily? Gerard Joulie: The most we ever served in a single day was exactly 1,939 dishes. Our yearly average is around 460,000. When you run a place with numbers like this, there is absolutely no room for experimentation. Thomas Schoenberger: In other words, when it comes to tradition, creativity is a mortal sin? Gerard Joulie: This restaurant would lose its reputation if we’d start to vary the way we serve the food. Creativity in the kitchen is something you can have in smaller, more sophisticated restaurants, frequented by customers who can judge and value the little changes. And afford them. But more often than not, I’m disappointed when I eat in a fancy restaurant. At Chartier, we have five cooks and twenty aides. And our book of recipes is law—it’s our constitution. No cook is ever allowed to change a dish. Ever. [spotting the food from a distance] Ah, here come the starters! Just imagine getting your escargot lukewarm and without the herb butter. Some regulars have been coming here for decades now. And it’s because they don’t like surprises. They prefer reliability. You might have noticed the long line every evening here at dinnertime. All kinds of people eat here and they usually know what to expect. Thomas Schoenberger: Here it’s the waiter’s job to seat you. And if you’re alone, you get seated at a table with strangers—also a time-honored custom. Gerard Joulie: Indeed. But we couldn’t offer the low prices if we didn’t use the space we have to full capacity. Custom is born from practicality. Max Dax: When do you put together the menu? Gerard Joulie: Every day, very early in the morning, two buyers do all of the shopping from our wholesaler. Usually around ten o’clock someone will update the menu according to the supply and then print it out. This place is organized around a very strict time schedule. Indeed. The mayonnaise, the boeuf bourguignon, the pot-au-feu—every dish has its own timeline. We prepare a lot of them in advance. The tête de veau, for example, is slowly cooked overnight so that it’s always ready by lunchtime. Waiter: Attention! Entrecôte! Tête du veau! Tartare de boeuf! Gerard Joulie: The tartare is made on the spot, of course. That’s strict law in France because it’s raw meat. Max Dax: Would you say dining at Bouillon Chartier is educational? It seems that if you’re a regular customer, you’ll automatically learn about the history and traditions of French cuisine. Gerard Joulie: I suppose you could call the restaurant a living museum. When we renovated it two years ago, we only painted the walls and polished the mirrors and the wood paneling. Nothing else. And in terms of food, what you can eat here is prepared the same way it was a century ago. Take, for instance the dorade au choucroute de la mer [seabass with seafood sauerkraut], a dish we offer regularly. In France, it’s an old tradition to eat fish and seafood with sauerkraut. I know that you don’t eat it that way in the rest of the world, but if you’re open-minded, you come here and give it a try. Who knows? Some people even get addicted. Thomas Schoenberger: So really only some of the logistics have changed. Gerard Joulie: Exactly. Nowadays we type up the menu on a computer whereas we used to use a typewriter. But the waiters and most of the staff—some of them have been here for decades, doing the same job every day. As time goes by, they’ve become specialists. You just can’t internalize that kind of routine in a week, you know? And tips are divided amongst all staff members. As for the regular customers, you shouldn’t underestimate the importance of recognizing the familiar face of “your” waiter. Everything at Bouillon Chartier is built on sustainability. And this is a big part of our formula for success. At the end of a regular day, almost every dish has been sold. Week after week, month after month, year after year. The system works. All photos by Luci Lux.